Christmas is just over a week away, it's right around the corner and I am finally starting to feel festive! When you get older Christmas seems to lose some of it's magic but having a child has certainly injected the excitement back into the festive period! 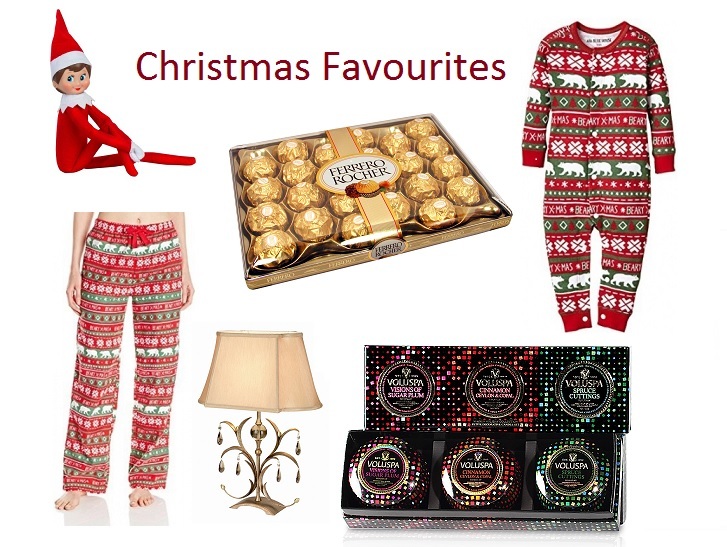 I'm so excited for Christmas this year, so much so I decided to put together a little post all about my favourite things this season. We started a new tradition this year with The Elf on The Shelf. 17 days in and we've had so much fun! Noah loves trying to find her every morning and usually has his advent chocolate after he does. I will definitely be carrying on this tradition again next year and many years to come. I'm a sucker for Christmas PJ's and I was recently sent a pair of Hatley Beary Xmas PJ's from the new Christmas range from Hatley. They are so soft, snug and cosy and I can't help but feel festive when wearing them in the evening. Christmas wouldn't be Christmas without my all time favourite chocolates! What are your favourites? I recently bought a new table lamp and it just so happened to look very festive and match my Christmas decorations perfectly. The lamp certainly won't be packed away with the decorations through, it's going to be out all year long! If you know me you will know how much I adore candles. I have tried so many brands but Voluspa are totally new to me. I am currently burning one of the beautiful scents from the holiday collection and it's absolutely divine, a new favourite of mine. Find more about them on their facebook and twitter pages. I wasn't the only one to receive some Christmas PJ's lately as Noah did too, matching ones! As if my love of Christmas PJ's couldn't get any bigger I then get my hands on a matching pair, I am now twinning with my son and I love it! The Beary Xmas Suit is the perfect romper for Christmas, it's gorgeous and is currently sat waiting in Noah's Christmas Eve Box! What have you and your family been loving this month? we do elf on the shelf and its a big hit in our house - they get so excited every morning! I still haven't got an elf on the shelf, I hope they've got some in the sales so that I've got one ready for next year!